Last week started online permit sales for upcoming season. Only after few minutes almost all fishing licences were sold. At the moment there are only some boat licences available for areas of Rapids Outakoski – Inarijoki and Nuorgam. Shore licences for fishing tourists are still available for Rapids Outakoski area for whole season and also for Vetsikko and Nuorgam areas regarding the late season. River Teno fishing licenses are distributed evenly between Finland and Norway. There are the total number of 5.500 fishing licences available for boat anglers and 5.500 licences for shore anglers from the Finnish quota of River Teno. 30 % of both quotas are reserved for the property owners who are living outside of Utsjoki municipality. If all licences from those above-mentioned special 30 % quotas are not sold online in time, fishing tourists have possibility to purchase them every week starting on Friday 15:00 PM. When you buy a license, you get a license code that allows you to get your license printed in River Teno permit points. There can also be licences available because of cancellations later on. 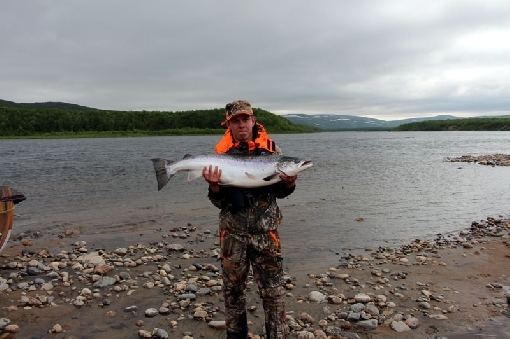 When timing is right, an angler can enjoy good salmon fishing on River Teno. To ensure the vitality of the salmon stock, fishing restrictions – e.g. reducing the number of fishing licences – has been carried out. Photo: Ismo Kolari.